As we embark on today’s Bead Soup Blog Party reveal, I’d like to start by thanking Lori Anderson, the visionary and organizer extraordinaire behind this fun and fabulous event...and my partner in this second reveal. If you haven't already, click over right now to her Pretty Things blog to see what Lori created from the Soup I sent her. Here’s a reminder of the sumptuous Soup I received from Lori. The Thai silver focal is embossed with elephants and my first design was inspired by the power and beauty of these animals, resplendent in their colorful trappings and ornate saddle cloths. The pendant arrived complete with fringed tassel added by Lori and her note let me know the chain was from AD/Adornments. Kathy Domokos still stocks the chain, so I was able to order some and separate the tiny metal drops to use as fringe on my brick-stitched bail. Although I used only the focal and the pewter spacers in my first piece, my color palette comes from the rest of the soup ingredients - the intensely saturated blues and aqua blue-greens of the Kazuri beads; a muted version of the orange-red from the handmade glass discs and the lighter purples in the amethyst. I wanted the necklace to have a tribal vibe, so I constructed two kumihimo ropes, using size 11 sterling, pewter and zinc metal beads, along with opaque gunmetal that closely matches the drops in Lori’s fringe, and wrapped the ropes tightly in peyote-stitched bands. The rope ends are finished with Kazuri rounds and the pewter spacers from Lori’s soup, which proved to be the perfect embellishment for my handmade S-clasp. I wanted this necklace to be adjustable from 16 to 19 inches, and I was reserving the pewter clasp for my second piece. The nearly matte finish of the deep amethyst discs is striking and brings out the luminosity of the Kazuri beads. For the bracelet, I scaled the kumihimo ropes down to one inch and used Japanese charlottes in pewter and silver to complement the silver tones in Lori’s clasp. The elephant charm is from Nina Designs. Again, thanks to Lori for sending such fantastic materials to inspire me. I still have lots to play with after today's challenge. But wait… the fun has just begun. Click on this link to explore the designs of all the other participants in the Second Reveal. OMG. Audible gasps that woke the cats when I saw that necklace. I'm in tears, it's so pretty. I can't wait to show Zack in the morning -- he's going to just stand there with his mouth wide open. You took SO much time with it (I wish you'd let me know you wanted chain, I would have sent some!). The bracelet is so beautiful, love the double loops. And the elephant charm!!!! Love! I am so honored to be your bead soup partner and I am so completely inspired by all of your work. Thank you from the bottom of my heart. I didn't realize how large that silver focal was until I saw the whole necklace. I love how you made an elegant structured piece that works so well with it geometrically. The whole design is very pleasing to the eye. Love the elephant charm on your bracelet--makes it so fun. What a pretty soup! So much effort you took for that adorable necklace. You did a wonderful job my dear! I love the colours and the way you catch the eye on that breathtaking beautiful focal composition! Stunning work and I love how the necklace flows and the clever colour blocking. The bracelet hoops are cool too. Amazing bead work! Both pieces are gorgeous. That necklace is simply stunning, beautiful, lovely, and all those other things. I love the fringe carried through from the focal to the bail on the necklace. 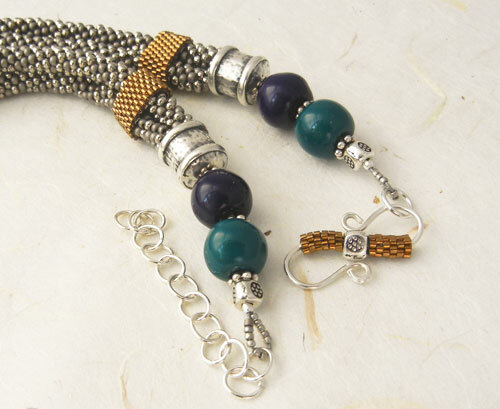 The bead weaving is a perfect fit from back to front. You hardly left space for me to focus on the bracelet, which is lovely in its own right. Wow!!! These pieces are truly gorgeous!!! OMG. I am in absolute AWE of that necklace. I am loving that so many seed beaders like myself have joined the party this time - and ALL have just blown. my. mind. Gorgeous pieces. Yum. Oh my Karin the piece is STUNNING! I love how you created that bail for the pendant and that fringe is awesome! WOW, WOW, WOW - I am going to have to clean off the keyboard because I drooled all over it. I can't wait until mom wakes up to show her - such a show stopper! Love that you were inspired by the elephant on the focal. The elephant charm on the bracelet is the perfect matching touch! Fantastic, Karin - another gorgeous creation! 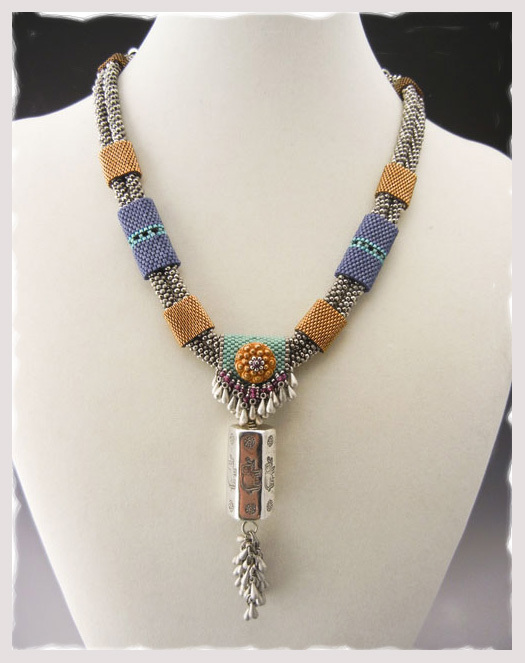 Love the double kumi, the peyote embellishments, the colors - just wonderful. Those are gorgeous pieces --I really love how you paired the purple with the glass. It's one of those color combinations I'd never have thought of and it brings out the beauty in both. That necklace is just fabulous. Wowzers!!!! The two ropes bound together with the peyote bands are such a great look. The added fringe above the focal. Great attention to detail, design and craftsmanship. STUNNING!!!! Gorgeous! Stunning! Perfect! .....(Still mouth wide open with a wow!) What a great soup, and what a great outcome! The amount of time and effort that must've gone into beading that necklace must be phenomenal - well done! It's superb! That necklace is absolutely stunning!! It's the first word that came to mind, and then I noticed from the other comments that it is the first word to come to the mind of many others! Wow. The effort to make the extra fringe above the focal really worked out beautifully. The bracelet is gorgeous too, of course, but it's hard to draw my eyes away from the necklace. I know Lori was hording that elephant bali bead but she sure chose the right person to gift it to. You are one talented artist...bravo, I love it!! Beautiful, love how the necklace echoes the color and shape of the focal without being too literal, and the fringe on the bail softens the look. The necklace is to die for, very elegant and bold! Wow! your work is amazing, thats a fabulous piece with the elephant pendant, beautiful. You are an amazing bead artist! 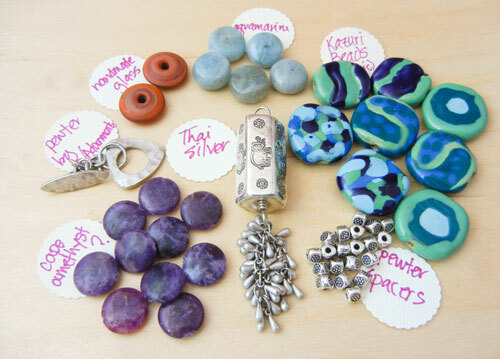 I have enjoyed looking at all your work, as well as your bead soup creations. Very inspiring. Just WOW! The necklace is amazing! Just gorgeous! 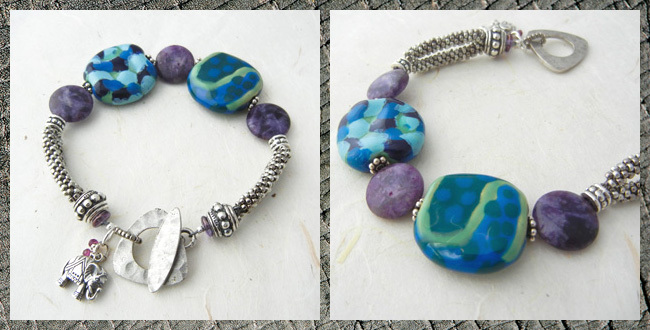 And I love the color combination in the bracelet. This is a most impressive necklace. You skill and composition are exquisite. Wow, that is a true statement piece and a work of art. Beautiful! Anyone who can sew seed beads like that is amazing! I love love Thai silver too, a great soup and you did it proud. WOW! I love your work. Just STUNNING! The necklace is beyond gorgeous. Your skills and creativity are awesome. I think your necklace is absolutely gorgeous, very tribal! Your necklace is really breathtaking. I love the necklace. I really like the fact you bought more of that chain and added it to your beaded piece. Oh and your photos are amazing too. Great job all around. Fabulous creations. You are one uber talented lady!! WOW! All is so beautiful! But the necklace is just fantastic! great seed bead necklace!im impressed! Thank you for visiting me and leaving such a lovely comment. Your necklace is just beautiful such lovely work and the soft colours go so well together, I like the bracelet too the tiny elephant was an inspiration! Oh my, that necklace is so beuatiful, I'm speachless!!! That necklace is just the most stunning piece... it gives such a wonderful feeling just looking at it ,I can't imagine how fabulous it would be to actually wear it!!!!!! Astounding and sublime. Fantastic pieces, especially the necklace. Your design really does justice to the majesty of the elephants themselves. Love it! All of your pieces are gorgeous,but I really love the bracelet. Great job. wow, this necklace is a piece of art, you are very talented! it is one of my favourite piece from the whole BSBP, really love it! also the other pieces are stunning. I'm on the 3rd reveal, partecipating for the 3rd time...what fun BSBP! Your necklace is very beautiful. You have done much thinking and designing, and the result is great. I like especially your sophisticated colors - not typical American, if I dare to say. Your necklace is stunning. Beautiful job. Simply gorgeous. I love the richness of texture and color and the deceptive simplicity of your design. Your lines are so clean and fluid, but add up to a sumptuous, elegant whole. This is definitely one of my favorites so far! Absolutely beautiful work. I hope you are picked for the potential magazine article. Love your work, so very precise and lovely! The necklace looks Art Deco to me, very nice. Your necklace just blows my mind it is so awesome! That fringe is perfect on the bail and the whole piece is really outstanding. Your bracelet is also fabulously beautiful. It's amazing how you pull all those tiny beads together into something that makes such a BIG statement. WELL DONE! Wow what a stunning piece! You have me inspired to learn kumihimo! Simply gorgeous! Lori sent your brilliant soup, and you made amazing pieces of it. I´m really impressed, not least of your beadwork. Love both your pieces - stunning! Wow! Your necklace is a stunner! Incredible! AWESOME, AWESOME, AWESOME. I love what you did with your pieces and I love the kumihimo rope. My gosh, I am in total Awe of that necklace. Kazuri beads have always been a favorite of mine ever since I first saw them and the bracelet with those beads is quite lovely as well. Your necklace is such an incredible design and the workmanship looks so precise. I am in awe and Lori must be beyond thrilled to see the gorgeous creation you made with the Bead Soup she sent. Karin, your work caused me to make a spectacle of myself -- I'm sitting in a hotel lobby, trying to catch up on the hop while away from home. My jaw dropped to the table top and I gasped. I don't care if the other patrons in the place are worried about me, because there was no other appropriate reaction to these pieces. They are truly, awesomely, gobsmackingly beautiful. Brava, my beady friend! Oh my goodness-the necklace you created is a stunning work of art! Wow Karin, is that one amazing piece. The soup that Lori sent you is fantastic and the bracelet that you also created is beautiful too. You are so incredibly talented, it is mind blowing! Thank you for inspiring us with you creativity! That first piece is absolutely stunning. Amazing work! Both of your pieces are absolutely stunning but the first piece is absolutely fantastic. There are not enough words to describe its beauty. Wow your piece is really beautiful. 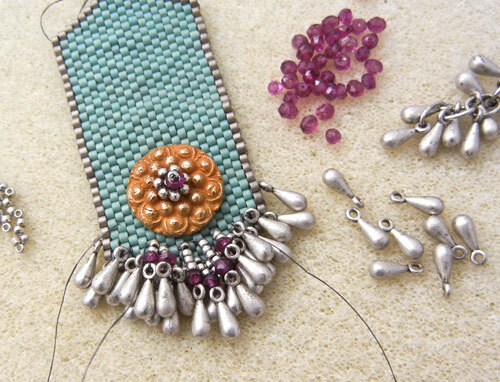 Great design, great color and your bead work is amazing! Both of your pieces are outstanding. Oh my. Both pieces are beyond gorgeous. The heft in the necklace really brings to mind the size of the elephants and the bail is a beautiful blanket for them. I especialy love the necklace, those ♥colours... great work, that piece! Your necklace is beautiful beyond belief!! I just love the style, the colors, the bead work--everything. But that muted orange is my favorite of the colors and I love the way you tightly wrapped the ropes with peyote stitch bands. Just fab .